Blood pressure can indicate a lot about a persons health. 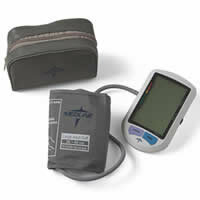 This isnt just the health of their heart as many different conditions can manifest through changes in blood pressure. This is why its so important to get a precise reading of this critical bodily attribute. Digital blood pressure units allow doctors and individuals to get an exact number on the critical details of blood pressure without having to read a gauge, which can unfortunately be misinterpreted. These are important to have for any modern practice.